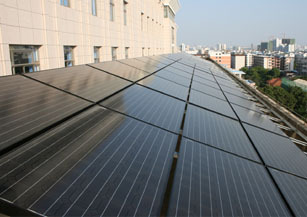 Project Introduction: Power of solar PV modules: 10kW. 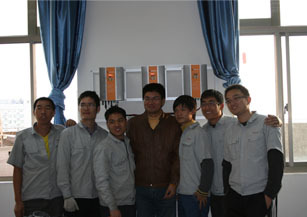 On-grid inverter model：GB3000B*3. 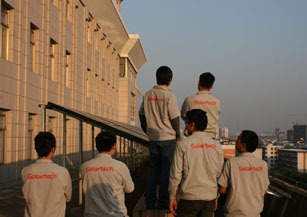 Project Background: At the end of October 2011, Solartech signed cooperation agreement on a PV grid-connected power generation project with Guangxi University. 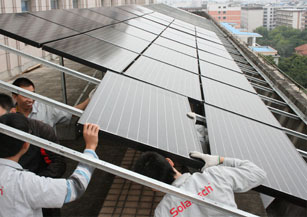 The system is using monocrystalline, polycrystalline and thin-film 3 different kinds of PV modules, with Solartech grid-connected generation control system, the power generation of different modules can be measured, make it easy for data analysis. The project was started on Dec 7th, 2011, and completed after 3 work days, now the system is working well. Economic Benefits: The Solar On grid inverter system can generate electricity 18000 kWh annually. In its 25 years lifetime, the system can save standard coal 169.2 tons, reduce 74.46 tons the of carbon dioxide emission, 3.38 tons of sulfur dioxide emission, 2.54 tons of soot emission, and 43.99 tons of ash emission.